the burgeoning city boasted a population of about 200. As the mines in the area were developed, Northern Pacific's branch line through the Yellowstone Valley to Cinnabar was completed to meet the need for cheap haulage. In 1883 mine operators began to ask for the extension of the road to Cooke. Access to the region was difficult from every direction. The only feasible route was from Gardiner, which entailed passing through the northern part of Yellowstone Park, and this the government refused to allow. In 1885, the first bill to remove the needed area from the Park was presented to Congress. The bill did not pass but efforts persisted for many years (Wolle 1963).
. The Homestake proved to be rich in gold, silver and lead ore and was mined extensively until 1894. To accommodate the miners and their families, Mathers constructed a small tent camp approximately 100 yards northwest and below the mine (24PA919). Two other mines on Henderson Mountain, the Daisy and Alice E. properties, began to be developed by 1888. When thirteen carloads of ore from the Daisy mine were shipped to Omaha for processing, the ore assayed at $50 per ton. This prompted the Daisy Mining Company to further expand their operations on Henderson Mountain. By 1890, the company had constructed a small stamp mill, boarding house, stables and cabins at the mine. The Daisy works were distributed among three adits with approximately 2385 feet of underground workings. The Alice E. mine produced 2500 tons of ore worth $14 per ton in a two year period. By 1890, 300 additional claims had been filed in the New World Mining District, with 259 of the claims located on Henderson, Scotch Bonnet, Crown Butte and Fisher (Red) Mountains. Together, these mines produced most of the over $50,000 in gold ore shipped from the district in the 1890s. However, by 1894, falling silver prices, a subsequent national economic slowdown and general inaccessibility of the mines caused the virtual cessation of mining operations in the New World district. The Daisy complex was purchased in 1900 by the Bliss Mining Company which desultorily mined the lower tunnel until at least 1912. By 1920, Western Smelting and Power Company purchased the Daisy, Alice E. and Homestake claims (Walsh 1910, 1912; Lovering 1929; Reed 1950; Wolle 1963). In 1905, the area was revived when several companies reopened old properties or made plans for development of new discoveries. The biggest project was that of the Montana Company which acquired nearly one hundred claims northeast of Cooke City and launched a large scale development program. The company properties included the National Park mines on Henderson Mountain, the Treadwell Group on Scotch Bonnet Mountain, as well as the Silver Fraction, Money King, Dalhousie, Sampson group and North Star mines. The company's holdings covered lumbering, electric power and smelting plants valued at $100,000 on the Clark Fork of the Yellowstone River and a townsite. By the winter of 1921 six companies were at work in the district, producing so much tonnage that the old question of a railroad was again raised. The railroad to Cooke City failed to materialize and, by the mid 1920s, property began to close down. Once again the problem of transportation was the greatest drawback to the districts development.. From 1905 to 1925, the production of the district is estimated at $215,000 in gold, silver, copper, and lead (Sahinen 1935; Wolle 1963). Between 1900 and 1955, the New World mining district produced 65,000 ounces of gold, approximately 500,000 ounces of silver and about 4,100 short tons of copper, zinc and lead. In the 20th century, the years of highest productivity were 1920-1929 and 1933 to 1955. While a remote and isolated region, the New World district was the third largest producer of precious metals in Montana in 1926 (GCM 1990). Geologically, the New World mining district is in the Cooke City structural zone. About half of the area is underlain by pre-Cambrian schist, gneiss, and granite. To the southwest these are overlain by Paleozoic sediments, including the Flathead quartzite, Gros Ventre shale and limestone, Gallatin limestone, Big Horn dolomite, Jefferson limestone, Three Fork shale, and Madison limestone. Tertiary volcanics, similar to those of Yellowstone Park, lie unconformably on Paleozoic rocks. The mineralization occurs at these contacts and provides a horizon rich in gold, silver, copper, lead and zinc. High sulfide (pyrite-chalcopyrite) zones are commonly associated with areas of gold, silver and copper bearing ore. Tertiary intrusives include stocks of monzonite, syenite, and gabbro; and dikes and sill, of various compositions (Sahinen 1935). Sahinen (1935) places the district 60 miles by road from Gardiner, the terminus of the Yellowstone Park branch of the Northern Pacific Railroad. GCM (1990) places the district about four miles from the northeastern boundary of Yellowstone National Park and approximately two miles south of the Absaroka-Beartooth Wilderness Area. Henderson, Crown Butte, Fisher (historically known as Red Mountain), Scotch Bonnet and Sheep Mountains dominate the landscape. The district also includes Daisy and Lulu Passes. A detailed geographic boundary of the mining district was developed by GCM Services (1990: Figure J-6) which corresponds to the area of historic mining in the district. Figure 1 shows the district as defined by GCM (1990) and the larger area encompassed by the AMRB (1994) boundary. One of the first major mines developed in the district, ore from the Republic mine was smelted in a small "Mexican" style furnace that was brought into the district in 1877. In 1882 the Republic Smelter was constructed to process the abundant Great Republic Mine ore. However, the ore proved to be too complex for the smelter. Open roasting of the ore was tried without success. A roaster was then added to the smelter. This also proved to be inadequate. A solution was reached in 1885, when Republic ore was combined with the purer Miller Mountain ore in the smelting process. By 1886, 420 tons of bullion from the Republic had been smelted and hauled by wagon to Cinnabar, the terminus of the the Northern Pacific Railroad. However the bullion was of such high lead content, the proceeds from its sale failed to pay mining, smelting and transportation costs. The mine superintendent Reuben Rickard proposed a desilvering plant. The silver would then be shipped to market. The lead would be stockpiled as an incentive for the railroad to come to Cooke City. When Republic stock holders could not come up with additional capital to build the desilvering plant, Rickard resigned, forcing the closure of the smelter and Great Republic mine. The property continues to be explored by its current owner. Several drill pads are scattered around the historic mine portals (Lovering 1929; Reed 1950). When it was revisited in 1990, the remains of the Republic Mine consisted of a long linear development of adits, stopes, shafts, tunnels and open face cuts. It has several roads linking these various mine features. There is also a collapsed compressor house, a load-out chute, tailings piles and foundations from worker cabins (Gray 1990). The Irma mine is an extension of the Great Republic Mine that was developed in the early 1880s. In 1920, a former Republic employee, Lyman H. Brooks, traced the Republic vein past the Republic claim. This was then claimed as the Irma. Work proceeded at first with hand drills, but in 1921 a compressor was installed to speed the drilling. By 1923, the shaft was 250 feet deep and by the next year the mine boasted of a tunnel 720 feet long. Ore was brought out of the shaft immediately above the ball-mill where it was processed. In 1927, a lower adit was opened down in the Republic Creek for waste rock disposal. Lyman H. Brooks was the mine supervisor during this development. His extensive mine records are still on the site. (Huckaba interview, 1990; Irma Mine Prospectus, Lovering, 1929). 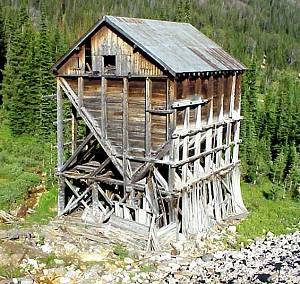 When it was revisited in 1990, the remains of the Irma Mine consisted of a shaft, a mill, a lower adit, a tailings pile, several cabin foundations, two garages and three standing buildings. An associated feature is the corduroy road that leads up to the site from the Republic mill (GCM, 1990). Located in Section 11, T9S, R14E, information on this mine is sketchy. Lovering (1929) describes a mine called the "Lula" or "Contact" near this site. Cooke City pioneer P.H. Branser had apparently worked the Lula and Contact claims since at least 1912, the most profitable year for the mine. Twenty tons of pyritic ore were shipped to the Allison Smelter in Cooke City with a $20 per ton return. According to the Livingston Enterprise, Branser filed two mining claims, the Lula and Contact, at this approximate location on July 16, 1920. A copper, gold and silver operation, the mine had only 400-500 feet of workings in 1925. Branser lived in a cabin on Lulu Pass. He died in 1939 without fully developing his mining claims (Livingston Enterprise July 30, 1920; Lovering 1929; Reed 1950). When the mine was revisited in 1990, the remains of the Lulu-Contact Mine included three mine adits and waste rock dumps located on the southwest flank of Scotch Bonnet Mountain. The site also includes two building foundations and prospect pits (GCM 1990). Located in Section 14, T9S, R14E, the Daisy Mine began operations in 1888. At first the mine shipped its ore to Omaha, Nebraska for processing, however, in either 1890 or 1891, a small 10-stamp mill was constructed just below the primary adit. The Daisy pulled ore out of three adits with a combined length of 2,385 feet. The main adit located just a few yards from the stamp mill site near the main road. This adit connected by a raise to an adit on the east side of the mountain. When the mine was inspected in 1914, these adits were found to be completely filled with ice. A stable, boarding house and two cabins were also located on the Daisy property. The mine's most productive years occurred between 1888 and 1890. In the 1890s, the Daisy, Alice E. and Homestake mines on Henderson Mountain generated the bulk of the New World Mining District's $50,000 in revenue. The mine and mill ceased production in 1894, in the wake of the drop in silver prices and the resulting national depression. By 1900, the Daisy complex was purchased by the Bliss Mining Company which desultorily mined the lower tunnel until at least 1912. It was purchased by the Western Smelting and Power Company in 1920. Unlike the former company, the Western Smelting and Power Company concentrated its efforts on the upper adit. Because the property was located adjacent to the company's Homestake mine, the ore present in the Daisy was extracted through the Homestake's workings in the 1920s. Between 1888 and 1894, wire gold and silver were extracted from the mine, but by 1925, lead and gold ore became the primary materials taken from the Daisy Mine. The stamp mill never reopened after 1894; its equipment was salvaged sometime before 1925 (Swallow, et al 1891; Walsh 1910; Lovering 1929). The Alice E. is located in Section 24, T 9S, R 14E. Discovered in 1884, the Alice E. is situated on the southern flank of Henderson Mountain a few hundred yards from the road to Daisy Pass. The ore that was removed from the mine assayed at $14 of gold per ton. The Alice E in 1890, along with the Daisy and Homestake Mines, all on Henderson Mountain, produced the lion's share of the district's $50,000 in revenue. Three years later a cyanide mill was constructed at the mine site to work the oxidized ore. By fall of 1894, the operation under the direction of George A. Packard had processed 2,500 tons of ore worth $35,000. Because the Alice E. was working easily refined gold ore, it was to a degree immune to the plummeting silver prices and nearly universal mine closures that followed in the heels of the deregulation of silver prices in 1893. The mill operated until 1895, when the easily worked oxidized ores ran out leaving only the more complex sulphides. In 1914, the underground workings were described as a 300 foot adit with a 100 foot cross cut. The cyanide plant and several associated cabins, although in a bad state of repair, were still standing when visited in 1928. At that time the mine was being worked as an open pit operation. The mill and cabins were destroyed in the 1988 Yellowstone forest fires (Gardner 1914; Lovering 1929; Reed 1950). The Homestake Mine is located in the southeast quarter of section 2, T 9S, R 14E. In 1949, the Homestake group of mines, owned by Parkmont Mining Co., included 18 patented and two unpatented claims. This mine can be traced back to 1885 when Sam Mathers filed a claim on what became the Homestake mine. Two years later, Mathers shipped 30 tons of ore from the mine to a smelter in Salt Lake City. The ore netted him $3,000 and encouraged him to continue work on the mine's three adits, numerous crosscuts and minor drifts. A shop and shed were constructed near the intermediate level adit. The gold and silver mine was one of 279 mining claims in the New World District and, along with the Alice E. and Daisy mines also on Henderson Mountain, was one of the most productive. A small tent camp, located below the mine may have been associated with the workings in the late 19th century. By 1894, mining at the Homestake had ceased in the wake of the Silver Purchase Act and the resulting national depression. By 1916, however, the Western Smelting and Power Company had purchased the claim, along with the Gold Dust claim, and planned extensive development of both mines. Located 700 feet below the Homestake, Gold Dust mining engineers and geologists expected to tap into the rich gold-copper veins exposed in the Homestake mine. In anticipation of the strike and the completion of the smelter in 1923, the company began construction of an aerial tram that connected the Homestake mine with the Gold Dust mine and the smelter, almost two miles away. At the time of connection with the aerial tram, the Homestake mine consisted of three adits and 700 feet of workings. Despite the predictions of the Western Smelting and Power Company planners, the ore body present in the Homestake mine was never struck by the Gold Dust miners. Both mines ceased operations by 1930. In 1948, the Parkmont Mining Company of Cooke City began a small open-cut mine on the Homestake claim and was recovering 70 tons of $11 ore daily by 1949. The open-cut was worked by a Koehring diesel shovel and a Sullivan wagon drill. By 1950, the underground workings were inaccessible (Livingston Enterprise 1916; Lovering 1929; Reed 1950). The Gold Dust mine, located 700 feet below the Homestake Mine on Henderson Mountain, was the focus of Western Smelting and Power Company's operations from 1920 to 1929. Organized in 1904 as the Precious Metals Company by Gottwerth L. "Doc" Tanzer, the company was also known as the New World Mining, Milling and Producing Company before it was finally renamed the Western Smelting and Power Company in 1912. Beginning in 1906, Tanzer launched an extensive campaign in the east and in Europe to attract investment capital to what he believed was an exceptionally mineral-rich area in the northern Rocky Mountains. By 1915, Tanzer had acquired enough capital to construct a 250 kilowatt hydroelectric plant on the Clark's Fork River four miles east of Cooke City. The power plant was constructed to provide 3,000 horsepower to a planned copper smelter and the Gold Dust and Homestake mines. In 1916, construction on the smelter began on Fisher Creek and was completed in 1921. Development work began on the Gold Dust mine in 1920 and it quickly became the center of the company's efforts throughout the 1920s. By expanding the Gold Dust tunnel to 1,000 feet, Western Smelting and Power Company mining engineers expected to tap into the rich gold-copper ore body struck by the Homestake mine. After the completion of the smelter and with over 1,100 feet of tunnel driven into the mountain, the company began construction on an aerial tram in 1923 to connect the Homestake and Gold Dust mines with the smelter, almost two miles away. The tram was completed in 1925. The Gold Dust mine was provided with electric lights, an electrically-driven air compressor (The Sullivan compressor is still intact in the building), air drills, ore bins, smithy, boarding house and cabins. The ore was removed from the mine by mule-drawn cars. "Doc" Tanzer supervised the mining operations, which occurred during the summer months throughout the 1920s. In 1925, the Gold Dust mine became known as the Adit. Although the tunnel had reached a length of 2,100 feet and was connected to the Homestake by a series of raises, the company failed to strike the expected ore body and, consequently, did not stockpile or process any ore at the smelter. By 1929, the Adit had struck only isolated pockets of wire gold and little processable copper. By 1930, Tanzer ended his association with the Western Smelting and Power Company and the firm was forced to sell its interests to a number of small mining companies including the Yellowstone & Western Mining Company (Livingston Enterprise 1916; Lovering 1929; WPA 1940). The Glengarry group, located at the head of the Clark Fork Basin in Section 12, T 9S, R 14E, consists of 28 patented claims. The property was aggresively explored and developed between 1920 and 1926 by means of four adits totaling 3,100 feet. The mine workings extend 2,300 feet horizontally and 450 feet vertically. A 25-ton flotation mill was constructed on the site, along with several support buildings and a small pyritic copper smelter. Several thousand tons of low grade, pyritic, gold-copper ore averaging about $9 to the ton in gold and small amounts of copper were blocked out, but no production records could be found. The operation ceased production in 1927 (Lovering 1929; Reed 1950). The deposit consists of pyrite, chalcopyrite and quartz occurring in a limestone block at the edge of a large monzonite mass, suggesting contact-metamorphics. The Scotch Bonnet Mountain gabbros form the north boundary of the deposit, and coarse-grained, altered monzonite porphyry forms the west and upper boundaries. Ore values at the surface range from $10 to $120 of gold per ton, though most appears to be low grade ores. A placer deposit of native copper lies near the lower Glengarry adit (Lovering 1929). Located in Sections 1, 2, 11, and 12, T 9S, R 14E, the Tredennick group of five patents lie on the southeast flank of Scotch Bonnet Mountain. Operations on the Tredennick began after World War I on a small, pyritic copper-gold deposit along a gabbro-granite contact. Development on this deposit began with a lower crosscut adit in 1922, but was shut down just short of the main deposit two years later as a result of financial difficulties. No production information was available, but the ore body was said to average about $10 a ton in gold. A total of 1,200 feet of workings were completed. The underground workings and several buildings and shops at the lower adit have all collapsed (Reed 1950; Lovering 1929). The deposit at the Tredennick consists of pyritic gold-copper ores in pre-Cambrian granites adjactent to a gabbro contact. This contact zone strikes about north, 55 degrees east, and dips 60 degrees east. The deposit ranges from 2 feet up to 30 feet in width, increasing to the east. The predominate ore minerals are auriferous pyrite and chalcopyrite, with minor amounts of galena and sphalerite in a gangue of ankerite and quartz. The ore is said to contain up to .5 ounce of gold per ton (Reed 1950; Lovering 1929). Other important mines in the district include the Isabelle, Upper Glengarry - Como Mines, Black Warrior, Mohawk Warrior, Bunker Hill, Morning Star, Greely, Houston, New World Mine, Treadwell Group, National Park Mine, Silver Fraction, Sampson Group and North Star Mine (Sahinen 1935; Wolle 1963; Reed 1950; Lovering 1929; GCM 1990). 1985 "Cultural Resource Inventory and Evaluation of the McLaren Mill Site, Cooke City, Montana". Prepared for the Montana Department of State Lands by GCM Services, Inc., Butte. 1921 "Cooke City and the New World Mining District", Min. and Sci. Press, Vol. 122, pp. 682-684. 1914 "Mining Claims Within the National Forests", Am. Inst. Min. Eng., Bull. 91, pp. 1467-1471. 1990 "Cultural Resource Inventory and Assessment: Noranda Minerals New World Mining Project, Park County, Montana" proposed for Hydrometrics, Inc by GCM Services, Butte. 1916 "Molybdenum; Its Ores and Their Concentration", U. S. Bureau of Mines, Bulletin 111. 1904 "Forest Conditions in the Absaroka Division of the Yellowstone Forest Reserve, Montana, and the Livingston and Big Timber Quadrangles", U. S. Geological Survey, Prof. Paper 29. Livingston Enterprise, July 30, 1920. 1916 (autumn) "Invests Hundreds of Thousands Will Reap Millions in Reeward." Livingston Enterprise. 1924 "Magmatic Chalcopyrite, Park County, Montana", Econ. Geology, Vol. 19, No. 7, pp. 636-640. 1927 "Organic Precipitation of Metallic Copper", U. S. Geological Survey, Bull. 795, pp. 45-52. 1929 "The New World or Cooke City Mining District, Park County, Montana", U. S. Geological Survey, Bull. 811-A, pp. 1-87. 1948 Gold Placers of Montana, Montana Bureau of Mines and Geology, Butte, Reprint 6, 1987. 1984 "Cultural and Paleontological Resources Synopsis Homestake Mining Company Jardine Project Park County, Montana". Prepared for Westech, Inc., Helena. 1948 Mines and Mineral Deposits (Except Fuels), Park County, Montana. U.S. Bureau of Mines Information Circular no. 7546. (Washington: GPO, 1950). 1950 Mines and Mineral Deposits (Except Fuels), Park County, Montana. U.S. Bureau of Mines Information Circular no. 7546. GPO, Washington. 1935 Mining Districts of Montana, A Thesis Submitted to the Department of Geology in Partial Fulfillment of the Requirements for the Degree of Master of Science in Geological Engineering. 1934 "Gold Activity for New World District", Min. Journal, Vol. 17, p. 5. 1910 Biennial Report of the Inspector of Mines of the State of Montana for the Years, 1909-1910.: Independent Publishing Company, Helena. 1912 Years, 1911-1912, Helena: Independent Publishing Company, 1912. 1963 Montana Pay Dirt: A Guide to the Mining Camps of the Treasure State. Swallow Press/Ohio University Press, Athens. 1941 Montana Mine Index, An Alphabetical Index Arranged by Counties, Districts, and Mines of Information on Montana Mines from 1867-1940. Montana School of Mines, Butte. 1907 "Butte,Montana; Tungsten Ore in the Butte Continental Districts", Min. and Sci. Press, Vol. 95, No. 23, pp. 705-706. No photos included in this work may be reproduced or utilized in any form by any means, electronic or mechanical, including photocopying, recording or by an information storage and retrieval system without permission in writing .